You must be a member of the Seville DinnerNations Group to attend this activity. Would you like to join this group? After a long period of absence, we come back with some novelties, the main one is that we have a new Consul . Theresa will share the organisations of monthly dinners, which is a real pleasure. This time we have chosen an excellent place for celebrating the reunion with old and new Friends. 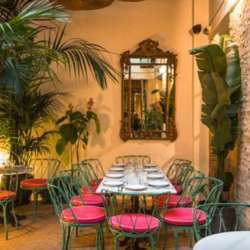 The restaurant, Torres y Garcia, is industrial in style with hints of rustic appeal, it specializes in regional ingredients prepared in an open wood oven. The roomy restaurant’s eclectic dining areas inspire contrasting ambient vibes. There are stark walls and brick accents, frescoes and modern art centering around an imperial table, and a wall of gourmet goods. As a novelty, every guest will choose his/her own menu and will pay accordingly. Please re-confirm your attendance by sending me a private message.